For the first book in the Mistborn trilogy, see Mistborn: The Final Empire. Mistborn is a series of epic fantasy novels written by American author Brandon Sanderson and published by Tor Books. The first series, published between 2006 and 2008, consists of The Final Empire, The Well of Ascension, and The Hero of Ages. To prepare readers for the second series, Sanderson wrote a transitional sequel, The Alloy of Law, which then turned into the first installment in the Wax and Wayne tetralogy, set 300 years later. The Wax and Wayne book titles are: The Alloy of Law, released on November 8, 2011; Shadows of Self, released on October 6, 2015; The Bands of Mourning, published on January 26, 2016; and The Lost Metal, currently in production. Sanderson also published a companion story to the original trilogy, titled Mistborn: Secret History, on January 26, 2016. There are two other planned trilogies, but they have no projected completion dates. The series primarily takes place in a region called the Final Empire on a world called Scadrial, where the sun and sky are red, vegetation is brown, and the ground is constantly being covered under black volcanic ashfalls. Every night the land becomes covered in an unnatural mist or fog. One thousand years before the story begins, the ruler of the Final Empire, the Lord Ruler, gained access to a divine power at what is called the "Well of Ascension", where he is rumored to have defeated the unknown danger called the "Deepness". With this power, he remade the world and everything in it into its state at the beginning of the first book. In the Final Empire, a Dominance is a territory within the Lord Ruler's empire. Luthadel is the capital of the Central Dominance and the entire Final Empire. Luthadel is the heart of the Lord Ruler's power, as well as the site of his palace, Kredik Shaw. Before the Lord Ruler remade the world, Luthadel was a mountainous region known as Terris. To hide the true location of Old Terris and the Well of Ascension, the Lord Ruler moved the mountains elsewhere and named that region "Terris" instead. Terris is the ancestral home of the Terris people. It is a mountainous region located north of the Northern Dominance. The Terris Dominance is the only Dominance to retain its original name. It was historically, the home of the Well of Ascension. Urteau is a key crossroads city in the Northern Dominance. It was the traditional seat of House Venture, although the family is based mainly in the capital. Later it came under the control of a Skaa dominated government led by a man calling himself 'the Citizen'. Urteau is also famous for its canals that mysteriously ran dry. It plays a key role in the third novel. Fadrex City is an important crossroads city in the Western Dominance. Although all cities outside of Luthadel are forbidden from having walls, Fadrex City has a natural rock formation that makes it very defensible. Lord Cett made this city his base after the fall of the Lord Ruler for this very reason. The nobility are the descendants of the early supporters of the Lord Ruler. The Lord Ruler gave them the gift of Allomancy because of their support, through a substance that exists only in the Well of Ascension. The Allomantic power has been passed down through the generations, but their Allomantic gifts have grown weaker over the years. "Mistings" have only one of the many Allomantic powers, while "Mistborns" have all the powers. At first there were few Mistings, but now Mistings far outnumber Mistborn. Allomancy is the main reason the interbreeding of nobles and skaa was made illegal by the Lord Ruler. The Lord Ruler had more control over the Nobles, so he didn't want the skaa to have Allomancy. Skaa are the descendants of the people who did not support the Lord Ruler when he first came to power. During the reign of the Lord Ruler, they were oppressed slaves treated brutally, with the law stating that they belong to the Lord Ruler but are loaned to the nobility for work. There were multiple skaa rebellions over the centuries, but they never came close to succeeding. All skaa Allomancers have some noble blood. Before the Ascension of the Lord Ruler, weapons technology had progressed to the invention of gunpowder. At the beginning of his reign, the Lord Ruler deliberately suppressed knowledge of gunpowder and most other advances. This was done to prevent technology undermining his military strength and being used against him in rebellions. This left archers as the only long-range military option, and it left skaa rebellions at a disadvantage because archers require considerable training. The only major advance since the Lord Ruler's reign started, is the invention of canned food. Kandra are highly intelligent life forms without distinct shape, physically resembling Mistwraiths in their natural form, however, they are shapeshifters. The prime function of the kandra are as spies, because of their notable ability to imitate any being. They can consume dead creatures, memorizing and replicating the physical traits perfectly. The First Generation of kandra were converted by the Lord Ruler, from pre-Ascension Terris Worldbringers, the sect of spiritual leaders and Feruchemists, resulting in the kandra calling him "Father". Worldbringers mainly used their Feruchemical abilities creating copperminds to store knowledge as religious philosophers and scholars. Mistwraiths are concentrated mistforms and mindless scavengers with the ability to add the bones of creatures they consume to their own forms. They are part of the reason why Skaa fear the mists. However, mistwraiths are relatively harmless. Named the Unbirthed by Kandra, the Mistwraiths can become Kandra. Koloss are of Ruin, and are violent creatures that kill with superhuman strength. They grow to a maximum height of about 13 feet, at which point their hearts cannot support their bulk and they die. They only have two emotional states: boredom and rage. The three Metallic Arts symbolize the three Realms of Existence: the Cognitive Realm, the Physical Realm and the Spiritual Realm. Allomancy is of Preservation. In the case of Allomancy, net power is gained. It is provided by an external source, Preservation's own energy. Hemalurgy is of Ruin. It destroys. By taking abilities from one person and giving them to another—in reduced amounts—power is actually lost. In line with Ruin's own appointed purpose—breaking down the universe into smaller and smaller pieces—Hemalurgy gives great gifts, but at a high cost. Feruchemy is the power of Balance. Of the three powers of the metallic arts, only Feruchemy was known to men before the conflict between Preservation and Ruin came to a head. In Feruchemy, power is stored up, then later drawn upon. There is no loss of energy—just a change in the time and rate of its use. Terrismen or Terriswomen with Feruchemical abilities are called Keepers. Not all Terris were Feruchemists, only very few. Each Keeper has a specific field of knowledge on which they focus, but all Keepers carry all of the previous Keeper's knowledge. The term "Twinborn" was not introduced until the fourth book. A Twinborn is a person with one Allomantic power and one Feruchemical power. There is no relation between the Allomantic and Feruchemical metals of a Twinborn and most of them have different ones. A Twinborn having the same Allomantic and Feruchemical affinities significantly enhances both, even if the abilities themselves are unrelated. It also allows Compounding, where an allomancer burns a metalmind which provides significantly more feruchemical effect than the charge of the metalmind. Preservation and Ruin are the two opposing gods of the Mistborn world, Scadrial. They are described as Shards of Adonalsium; fragments of the power of creation. Preservation and Ruin agree to a pact between gods, with an initial stalemate between them, each aware that only together could they create and achieve their separate goals while knowing they would never gain complete final satisfaction. Preservation could not keep things perfect and unchanging and Ruin could not destroy completely. Ruin is of destruction, without malice, but intent on reducing everything to the molecular level. Imprisoned by Preservation in an attempt to prevent Ruin from destroying the world, Ruin's consciousness was trapped by the Well of Ascension and kept mostly impotent. Ruin's remaining strength enables it with small powers to alter writing and Feruchemical Memories, but it cannot alter writing inscribed in metal or normal memories. It was Preservation that wanted to create life on Scadrial, but needed Ruin's help to do so. In exchange for Ruin's help, Preservation promised that Ruin would be allowed to destroy everything one day. However, after they had succeeded in creating the world, Preservation reneged on its bargain and sacrificed a significant portion of its power to create the Well of Ascension as a prison for Ruin to prevent the destruction of the world. The Steel Ministry is the name of the religion that the Lord Ruler established for everyone to worship him. The Lord Ruler allowed the Nobles to control most aspects of the empire, such as the production of resources, but he used the Steel Ministry to control the Nobles. The Steel Ministry has two groups of people who are used to control different aspects of society; Steel Inquisitors and Obligators. Inquisitors are creatures of Ruin; their powers are gained through Hemalurgy. An Inquisitor is created when several Hemalurgic spikes are pounded through a Feruchemist or an Allomancer into the body of a human, usually an Allomancer or an existing Inquisitor. The Obligators were drawn from the ranks of nobles, usually Allomancers and are trained in the arts of bureaucracy and the teachings of the Steel Ministry. They are marked by tattoos which decorate their face and body; the more tattooed an obligator is, the higher his rank. They serve as witnesses for every possible legal contract (e.g., business deals and marriages), which means that they are privy to all happenings among the nobles. Most Obligators are mistings with the power of allomancy called a "seeker", meaning that they can burn a metal to see if there are other Allomancers nearby. This gave the Lord Ruler great control over the nobility, as any contract not witnessed by one of his Obligators, did not officially take place. The Church of the Survivor worships Kelsier, who served as its first martyr. Vin, the Heir to The Survivor and Kelsier's 'disciple', was also worshiped. Kelsier created the Church as the means of spreading hope for freedom and equality among the Skaa, so they would finally rebel. There are a number of other religions in the series, which are studied for historical and philosophical purposes only. Sazed is a Terris Keeper whose specialty is in pre-Ascension religions. Sazed mentions that the Keepers recorded at least five hundred and sixty-two different belief systems, including sects and branches of the same religions in their metalminds. However, none are currently practiced, as the Lord Ruler suppressed them over the years. In the Mistborn universe, magic is depicted as a supernatural force harnessed by three distinct disciplines: Allomancy, Feruchemy, and Hemalurgy. All three magic systems are based on metals, which are used by the magician to grant them specific abilities. Their power originates in the Shards, Preservation and Ruin; the two god-like deities that are present in the Mistborn world. In the Mistborn series, Allomancy is a predominantly genetic ability that allows a person to metabolize ("burn") metals, ingested by the Allomancer, for magical powers that can enhance physical and mental capacities. There are 16 metals that such Allomancers can use, with each metal granting a specific ability. In addition to these, there are two fictional metals, Atium and Lerasium that are the solid manifestation of the powers of Ruin and Preservation respectively. A person who is only able to burn one of the Allomantic metals is known as a Misting. Anyone who is naturally capable of burning all of the metals is called a Mistborn. In the first trilogy, only Mistings and Mistborn existed, although in the second series, interbreeding caused a new phenomena of people with one Allomantic and one Feruchemical ability, called Twinborn. Lerasium beads: Burning the fictional metal, Lerasium, which is the solid form of Preservation's power, turns a person into a Mistborn. This was how the Lord Ruler "created" the Allomantic bloodlines among the Final Empire's noblemen. Snapping: The mists, the gaseous form of Preservation's power, that appear in the Mistborn world when power returns to the Well of Ascension would begin to violently activate ("snap") innate Allomantic abilities in people. Genetic descent: Descendants of Allomancers were also likely to have Allomantic abilities, though it takes physical anguish to awaken them. The Allomantic metals come in four groupings of four metals: Physical, Mental, Temporal, and Enhancement. Each of these four groupings have two base metals and their corresponding alloys, which in turn have a related ability that counteracts or balances the base metal. Each metal produces an internal or an external effect. In addition to the basic Allomantic metals, there are two fictional "God metals": Atium and Lerasium and their alloys. Burning lerasium or its alloys can turn regular humans into Mistborn and Mistings respectively. Atium allows Allomancers to see into the future. In The Final Empire, an atium alloy called Malatium is revealed, which allows an Allomancer to look into the past. A misting who can only use atium are called seers. In The Hero of Ages, the atium-Misting Yomen appears to believe that atium and malatium are among the standard Allomantic metals - of which, at the start of the series, only ten are known to normal allomancers, including atium and gold but not malatium or electrum: the latter two are "discovered" during the series, along with aluminum and duralumin, all having been previously known to the Lord Ruler but kept secret. Thus, with these four discoveries, the original ten, and the revealed importance of the number sixteen, Yomen - and later Sazed, when he ascends and leaves behind his final written message - come to the conclusion that since there are now fourteen known Allomantic metals, therefore there must be two more that are unknown (which the Lord Ruler may have also known about, but did not reveal the knowledge, and certainly nobody else knows). Whereas in fact, with atium and malatium not counting among the sixteen, there are in fact not two but four unknown metals (chromium, nicrosil, cadmium and bendalloy) which do not appear till later books. "Lerasium" is also not given a name in the initial trilogy, nor counted as an allomantic metal, although its last known bead is used to turn the previously "normal" Elend Venture into an unusually powerful Mistborn. Allomancers who flare their metal intensely for extended periods of time may be physiologically altered by the constant influx of Allomantic power. These Allomancers are known as Allomantic Savants. These people experience heightened ability with, and dependence upon, whatever metal they are burning in such a manner. Under most circumstances, this is considered damaging and it is believed that this process is irreversible, without powerful external intervention. Feruchemy is a genetic ability found among the people of the Terris region of the Final Empire in Brandon Sanderson's Mistborn Series. A person who can use only one Feruchemical metal is known as a Ferring, while those who can use them all are called Feruchemists. Feruchemy involves the use of the same metals as Allomancy, but rather than ingest the metals, they can be worn or carried by the Feruchemist. Unlike Allomancy, the metal itself is not consumed but is used as storage of the Feruchemist's own attributes. Feruchemists refer to the metals that they use as metalminds. As long as a metal is in contact with the skin and the Feruchemist has stored something in it, it can be drawn upon. Usually only the Feruchemist that originally stored the attribute can use it. During the events written by Sanderson in The Final Empire, the Lord Ruler hunted any and all Feruchemists he could find and it was commonly believed before The Fall that Feruchemists had been entirely exterminated. It was revealed in The Final Empire that they had not all been killed and that shortly after The Fall, they began to travel and teach the skaa the things that they needed to know to effectively live and develop on their own. All Allomantic metals can be used for Feruchemy but the primary difference between Allomancy and Feruchemy is the way that the metals are used. All an Allomancer needs to gain an ability is burn the appropriate metal but a Feruchemist must spend time without whatever attribute they wish to store. The Feruchemist can then tap into those stores at a later time, making themselves superhumanly powerful for a short duration. In The Alloy of Law, it is revealed that the mixing of Allomantic and Feruchemical bloodlines led to the creation of Twinborn; people who had one Allomantic and Feruchemical ability. Twinborn also have a mysterious extra "effect" that gives them powers slightly beyond what the sum of their standard feruchemical and allomantic powers might imply. Hemalurgy is the third metallic art in the Mistborn series, and is based on the powers of the deity Ruin. It allows the transfer of allomantic and feruchemical powers from one person to another, though with a net loss of power. It is the least known among the three arts. The most important factor in determining what power is transferred is the type of metal used, with the specific points chosen on the donor and recipient also having an effect. The most common method is to stab the hemalurgic spike into the heart of the donor, continuing immediately through their body to the recipient's, as the longer the spike is left out of a body, the more power it loses. Piercing critical organs of the receiver such as their heart or brain does not necessarily kill them. However, having a hemalurgic enhancement makes one susceptible to outside influence. Hemalurgic creations, like the koloss and kandra as well as the Steel Inquisitors can be controlled by a sufficiently powerful emotional allomancer. In early 2009, Brandon Sanderson announced he was working with Crafty Games to release a role-playing game based on the series. While the release date was originally placed as "sometime in 2009", it shifted multiple times before being released in December 2011 in PDF, softcover, and hardcover editions. In 2010, Brandon Sanderson optioned the rights to the Mistborn books to Paloppa Pictures LLC. In Q1 of 2014 Paloppa Pictures' option ran out. In October 2016, the rights to the entire Cosmere universe, including the Mistborn series, were licensed by DMG Entertainment. In January 27, 2017, Deadline Hollywood reported that DMG signed F. Scott Frazier as the screenwriter for the adaptation of Mistborn: The Final Empire. In March 2012, a video game prequel called Mistborn: Birthright was announced slated for a fall 2013 release. The game had been delayed until 2015 to take advantage of the PlayStation 4 and Xbox One and then delayed again to Fall 2016. Sanderson said in a November 2016 Q&A that Mistborn: Birthright is "dead". Developed by Little Orbit, Brandon Sanderson had written the story of the game. On July 24, 2017, an official cancellation of the game was posted by the CEO of Little Orbit, Matthew Scott, on Facebook. In 2016, a kickstarter campaign raised funds for a board game centered on the Mistborn series called Mistborn: House War. Developed by Crafty Games and designed by Kevin Wilson, House War is the first board game set in the Mistborn world and takes players on an adventure to play the role of leaders of the great noble Houses, struggling to weather the cataclysmic events of the first novel of the series. The game started shipping to backers in late August 2017. In 2018, a digital version of the boardgame was published on Tabletopia. The original trilogy is the first in what Sanderson calls a "trilogy of trilogies." The original second trilogy was to be set in an urban setting, featuring modern technology, and the third trilogy was to be a science fiction series, set in the far future. Mistborn: The Alloy of Law was set to be a transitional book between the original trilogy and the second trilogy. However, it turned into a fourth series, this time of four books. Sanderson's announcement on August 1, 2012 to write a sequel to Mistborn: The Alloy of Law, titled Mistborn: Shadows of Self, published October 6, 2015, meant Mistborn: The Alloy of Law would not stay a stand-alone novel. However, the series will not take the place of the originally-planned second Mistborn trilogy, but will instead become a spinoff series, with a third book published as Mistborn: The Bands of Mourning and the fourth book under the working title of Mistborn: The Lost Metal. There is no scheduled release date for the contemporary trilogy or the science fiction trilogy. ^ a b "Tweets November 12–19". Brandonsanderson.com. 2010-11-19. Retrieved 2010-11-24. ^ a b c d Sanderson, Brandon (December 18, 2015). "State of the Sanderson 2015". Retrieved January 20, 2016. The original pitch was for three trilogies. The Wax and Wayne books expanded this to four series. (You can imagine Wax and Wayne as series 1.5, if you want.) This means there will still be a contemporary trilogy, and a science fiction trilogy, in the future. ^ "Mistborn: The Alloy of Law Cover & Details Emerge!". Tor.com. Retrieved 2011-03-18. ^ "Brandon Sanderson continuing Mistborn with The Alloy of Law". SFScope. December 3, 2010. Archived from the original on December 8, 2010. Retrieved December 4, 2010. ^ "Tweets November 5–11 part 2". Brandonsanderson.com. 2010-11-11. Archived from the original on 2010-11-23. Retrieved 2010-11-24. ^ "The Final Empire Text Stats". Amazon.com. Retrieved 7 December 2016. ^ "The Well of Ascension Book Details". AR BookFinder. Retrieved 7 December 2016. ^ "The Hero of Ages Book Details". AR BookFinder. Retrieved 7 December 2016. ^ a b c Ahlstrom, Peter (September 22, 2015). "Alloy of Law is 97k. Shadows of Self is 112k. The Bands of Mourning is 127k". Retrieved June 15, 2016. ^ "Mistborn Fans Will Get TWO New Novels Next Year!". Tor.com. Macmillan Publishers Ltd. Retrieved 18 December 2014. ^ "Well of Ascension - The Coppermind - 17th Shard". coppermind.net. ^ "Lord Ruler - The Coppermind - 17th Shard". The Coppermind. 2013-08-02. Retrieved 2013-09-30. ^ "Worldbringers - The Coppermind - 17th Shard". The Coppermind. 2012-12-15. Retrieved 2013-09-30. ^ "Metallic Arts - The Coppermind - 17th Shard". The Coppermind. 2013-09-17. Retrieved 2013-09-30. ^ "Introduction to the Cosmere". Retrieved 2018-08-15. Dominion, Devotion, Ruin, Preservation, Honor, Cultivation, and Odium are Shards of Adonalsium. ^ Stone, Eric James (23 July 2006). 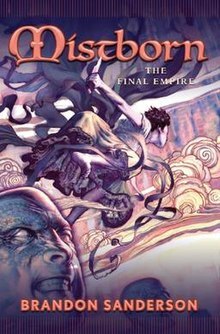 "Book Review: Mistborn: The Final Empire". ericjamesstone.com. Retrieved 6 December 2015. ^ Kain, Erik (6 February 2013). "'Mistborn' Review: A Fantasy Masterpiece". Forbes. Retrieved 2 December 2015. ^ Sklaroff, Sara (30 July 2006). "Science Fiction & Fantasy". The Washington Post. Retrieved 2 December 2015. ^ Sanderson, Brandon. "The Reason for Mistsickness". Retrieved 2 December 2015. ^ "The Hero of Ages: chapter 38 annotation". ^ a b c Cahill, Martin (17 June 2015). "Learn About the Many Magic Systems of Brandon Sanderson". Tor.com. Retrieved 6 December 2015. ^ "Brandon Sanderson's Mistborn Adventure Game". RPG.net. 21 January 2013. Retrieved 12 December 2015. ^ "Feruchemical Table Poster". The Brandon Sanderson Store. Retrieved 12 December 2015. ^ Hill, Joshua; Peters, Koen. "The Alloy of Law by Brandon Sanderson". Fantasy Book Review. Retrieved 12 December 2015. ^ Sanderson, Brandon. "Annotation Mistborn 3 Chapter Thirty-Five". Retrieved 9 January 2016. ^ Sanderson, Brandon. "Annotation Mistborn 3 Chapter Thirty-Nine". Retrieved 9 January 2016. ^ "Mistborn RPG Release?". Crafty Games. Retrieved 2009-12-04. ^ "Mistborn Adventure Game". Crafty Games. Retrieved 2011-09-27. ^ "Mistborn Adventure Game". Crafty Games. Archived from the original on 2012-04-16. Retrieved 2011-12-15. ^ Brandon Sanderson (January 11, 2010). "Press Release: Mistborn Movie Option". Retrieved January 15, 2010. ^ Brandon Sanderson (February 21, 2014). "Mistborn Film Rights". Retrieved July 25, 2014. ^ Lang, Brent (2016-10-27). "DMG Nabs Rights to Brandon Sanderson's 'Cosmere' Book Universe in Massive Deal (EXCLUSIVE)". Variety. Retrieved 2016-10-31. ^ Tartaglione, Nancy (January 27, 2016). "DMG Entertainment Taps F Scott Frazier To Adapt 'Mistborn: The Final Empire'". Deadline Hollywood. Retrieved April 30, 2017. ^ a b Sanderson, Brandon (July 25, 2013). "State of the Sanderson". Retrieved January 20, 2016. ^ "Mistborn: Birthright Facebook page". Retrieved January 24, 2015. ^ "Mistborn: Birthright moved to next gen systems". June 28, 2013. ^ Librería Gigamesh (5 November 2016). "Eurocon 2016 - Sala Teatre - Interview with Brandon Sanderson (ENG)" – via YouTube. ^ "Mistborn the videogame coming to the Xbox 360, PlayStation 3 and PC in 2013". Archived from the original on March 29, 2012. Retrieved March 27, 2012. ^ "Hello everyone. This is Matthew Scott, the CEO for Little Orbit, and I think we're overdue for a final update on Mistborn: Birthright". Facebook. Matthew Scott. July 24, 2017. Retrieved July 25, 2017. ^ "Mistborn: House War on BackerKit". BackerKit. ^ "The Battle Of Houses Begins In Mistborn: House War - Bleeding Cool News And Rumors". 16 June 2016. ^ "Update 59: [US Backers] Board Game Final Pick-Up Complete · Mistborn: House War". Kickstarter. ^ "Mistborn: House War". Tabletopia. Retrieved 6 July 2018. ^ "'Mistborn' Review: A Fantasy Masterpiece". Forbes. 2013-09-16. Retrieved 2013-09-30. ^ "Another Long and Rambling Post on Future Books". BrandonSanderson.com. Archived from the original on 2010-10-17. Retrieved 2010-10-13. ^ "Today I got up, and I did not have a Wheel of Time book to work on". BrandonSanderson.com. 2012-08-01. ^ Sanderson, Brandon (December 18, 2014). "State of the Sanderson 2014". Retrieved January 20, 2016. This page was last edited on 19 April 2019, at 07:35 (UTC).